We're gearing up for some additional photography on Carbon Copy. 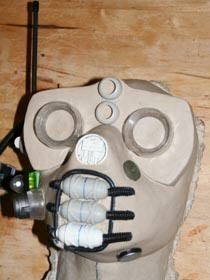 Brian Schiavo is building some (5) masks for the androids. What we need is a rock quarry -- preferably in Pennsylvania (because we'll have airsoft and paintball guns which look like real firearms). What would be even better is if there was some sort of abandoned steel mill there. We're shooting in the "Philadelphia Desert" and in post-apocalyptic New York City. The eyes will have lenses. Get thee to Bethlehem and Scranton, my son. Yes but that's actually in New York State. Which is a problem re: firearms laws. What's the equivalent in PA? That particular planet is in Lackawanna NY. "Shirley naught!" thought I. But lo, Bellware was right, and my associations with Lackawanna were misleading at best, deceitful at worst. It coulda been worse. It coulda been Hoboken.